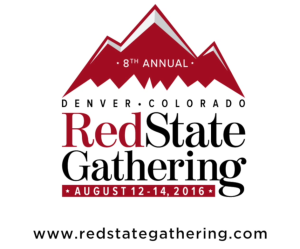 Washington, D.C. – In a highly competitive selection process, Townhall Media announced Thursday that the 2016 RedState Gathering will be held in Denver, Colorado. This is the first time the Gathering will take place in Colorado and also the first time the event has gone to any Western state. Next year’s conference will run from noon Friday to noon Sunday at the Grand Hyatt Hotel, August 12-14. Over the past seven years, the RedState Gathering has grown from a small group of activists in 2009 into a leading grassroots event, held each summer in different cities across the country. Dedicated conservatives and principled politicians make the RedState Gathering an annual stop. Previous Gatherings have taken place in Charleston, Atlanta, New Orleans and Dallas/Fort Worth. For more information, including details on registration and media credentials, please visit redstategathering.com. Highlights from the 2015 RedState Gathering in Atlanta can be found here. Townhall Media, an affiliate of Salem Media Group, is a conservative news organization leading national discussion with political commentary and analysis. Our unique collection of web properties includes Townhall, HotAir, RedState, Twitchy, BearingArms, TownhallFinance, and HumanEvents. The Townhall Media platforms reach more than 16 million unique visitors each month with over 100 million monthly page views, and our top editors contribute daily to major cable news networks.